I've almost at the last stage of my table runner. Though at this point, I am really wondering if I'll use it as a runner for the fear of stains. I am dilly dallying between runner and framed piece now. Not sure if framing such a long piece is practical. 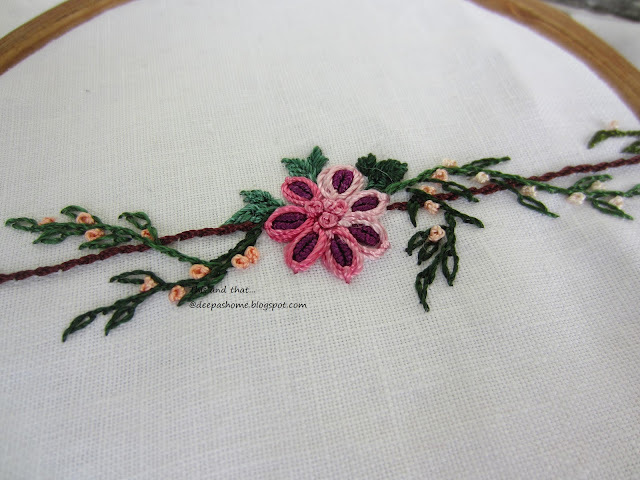 I have added a lot of green vines to the border. 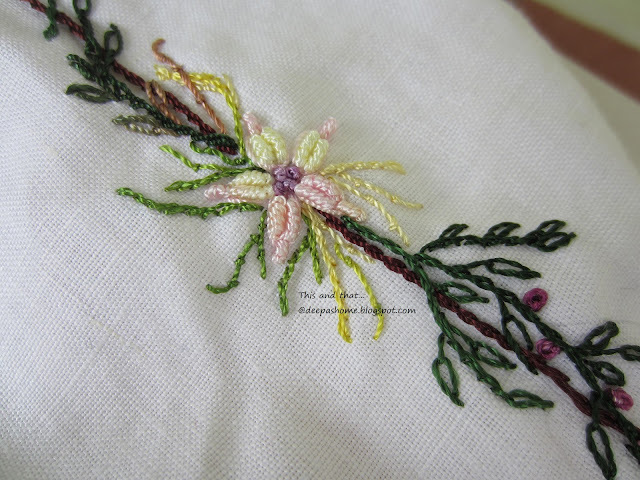 Initially I started with simple lazy daisy stitch for leaves. The look was ok, but then I wanted some more sharpness to the shape of the leaves. For that look, I tried the reverse lazy daisy. Here's how the looks differ. I love the reverse lazy daisy!! Now the piece is full of them [smile]. I also added a couple more flowers. The one below is called fancy daisy. I did not like the look or the color of it in the instructions and I skipped some fancy additions that were supposed to be stitched to the flower - like pistils projecting from between the petals. I like the one I made though. This one below is called wild rose. I have tried a stitch which I have never used before. The original instructions had only five petals. I hated it. But I wanted to try the technique. So I increased the number of petals to 7 thus making the petals smaller. I am all out of dark green threads now. The next set of flowers will all be with pale green leaves and fine growth.The last set of flowers have been started. The piece then needs to be washed and backed up. Next post will be the completed piece for sure!! The weather outside has turned slightly colder and the leaves have all turned into the beautiful fall color. The life of the leaves always fills me with awe..when they are born, they give joy to all . They nurture and feed and soothe everyone during their lifetime and when they are about to fall, they do so with so much color and grace. Beautiful way of ending the post. Love those words. Are you the poet? I didn't knew the reverse lazy daisy much pretty than lazy daisy in my opinion and a good idea for leaves. Last flower is made with double lazy daisy? 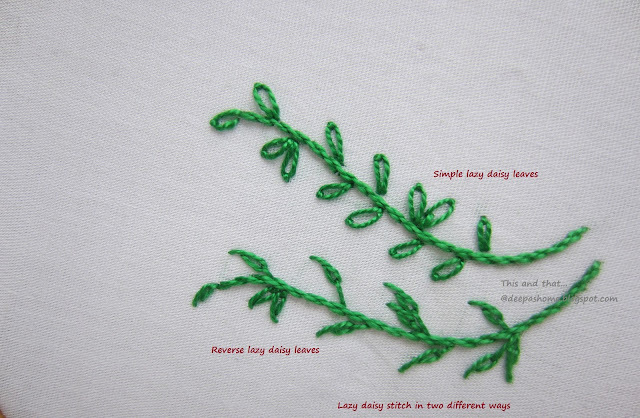 Actually I have never even thought of reversing the Lazy Daisy stitch, but it makes a lovely sharp shape. The added flowers all grace this long 'table runner'. Yes, it would be sad if it was stained. Framing it might cost you a lot as the frame would have to be order made. How about backing it with sturdy fabric and adding a 'hanging sleeve'? You are so right in what you say about the life of a leaf. These are all such pretty flowers! About the question about using as a runner or framing it - you could always still use your original plan but just have it on your table when it isn't in use - remove it when there's food/drink nearby. 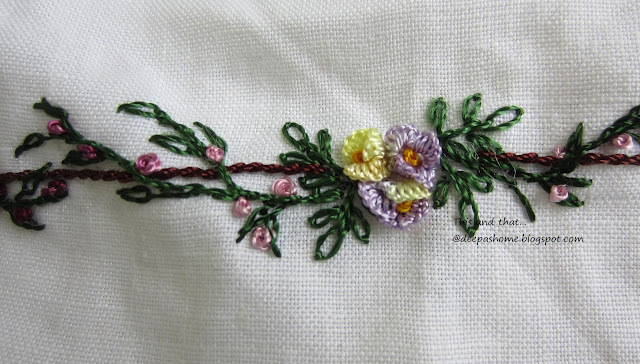 Your embroidery is looking beautiful! I have never tried reverse lazy daisy but sometimes my regular lazy daisies looked thin and elongated. 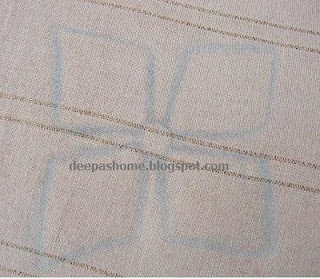 The reverse stitch you invented gives a nice effect. What a lovely piece! I agree with Rachel, I'm not sure i'd frame it. My grandmother gave me some of her hand embroidered tablecloths, and at first I didn't want to use them, but she convinced me to as that was the point! Thanks for your email. I am with Rachel it would be a pity to put such lovely piece behind a glass. Your stitching is beautiful, and very inspiring. This week I made a tissue holder as a present for my mother, and decided it needed embroidery. Mine won’t be up to your standard as I don’t have your experience with so many stitches, but I was thinking about the embroidery one sees in the shops, and often I think “I could do that!”, so I’ve had a go! Aiming to blog a picture sometime this week, hopefully. I agree with Rachel, and Mary Anne! I think you should use your piece as a table runner, as you first intended, and remove it when meals and drinks are about. So much nicer to see and touch it every day. Quite the heirloom piece too!